Contrary to popular belief, puppies don't teeth like humans. While they do lose their 'baby teeth' around 3-9 months old, the actual destructive chewing (also known as 'puppy teething') is usually due to behavioural issues, not the teething itself. These behavioural issues need to be dealt with early. 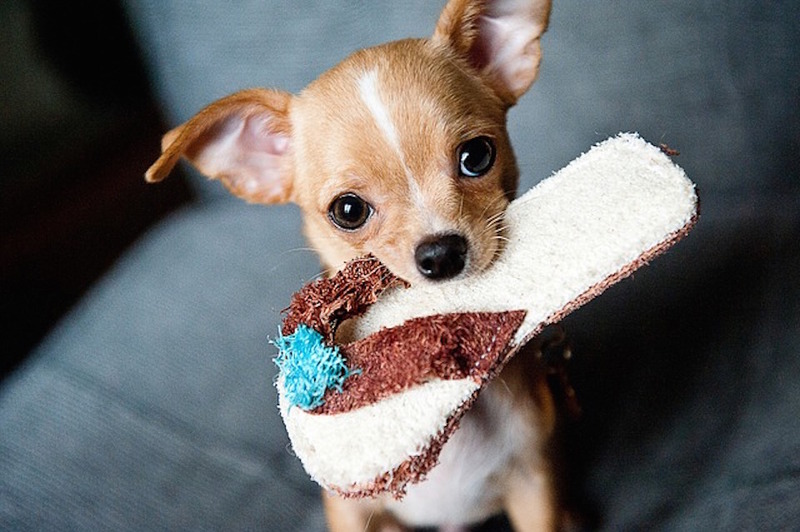 Don't tempt your puppy with yummy furniture and shoes! Block your puppy's access to areas that contain chewable items, then work on training your puppy to not chew at all. Introduce age-appropriate chew toys early and save your precious household items. Chew toys specifically designed for puppies tend to be smaller and softer than toys made for adults, because puppy teeth are more fragile. These toys should still be durable enough to handle aggressive chewing. When playing with your puppy, remove any destroyed chew toys immediately to prevent accidents. Caring for a teething puppy requires also caring for the puppy's teeth. Make sure your puppy is eating a properly balanced diet, including vitamins and minerals such as calcium. This will allow their new permanent teeth to develop normally. Remember, having two teeth crowded into a space meant for one can cause discomfort and possibly bring out some destructive tendencies in your puppy.